ORTELIUS - Moraviae, quae olim Marcomannorum Sedes, Corographia, A.D. Pavlo Fabritio Medico et Mathematico Descripta. . .
ORTELIUS, A. - Moraviae, quae olim Marcomannorum Sedes, Corographia, A.D. Pavlo Fabritio Medico et Mathematico Descripta. . .
Moraviae, quae olim Marcomannorum Sedes, Corographia, A.D. Pavlo Fabritio Medico et Mathematico Descripta. . . - ORTELIUS, A. Title : Moraviae, quae olim Marcomannorum Sedes, Corographia, A.D. Pavlo Fabritio Medico et Mathematico Descripta. . .. Size : 13.9 x 18.5 inches. / 35.3 x 47.0 cm. Description :Copper engraving, uncolored as published. Fine and decorative early map of Moravia, Slovakia prepared by Paul Fabritius (1569) and revised by Crato. 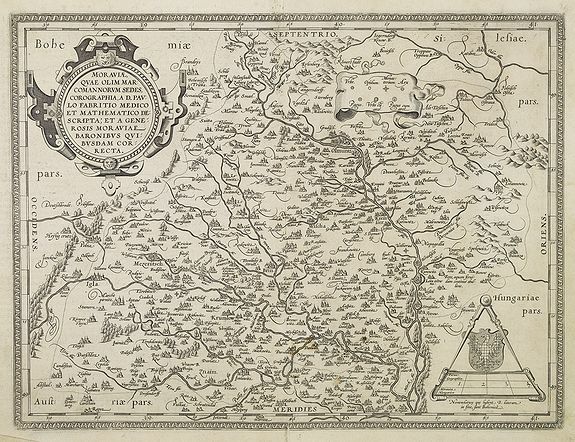 The map provides good information's on early place names in the 16th century in Moravia, as well rivers and mountains are engraved. Villages and towns are still shown as miniature views. In the upper left corner we find the renaissance cartouche and in the lower right corner we see a mileage scale with a circle and the coats of arms of Moravia.